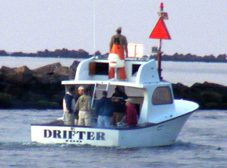 The DRIFTER TOO Charter Fishing Boat at Jim's Dock. 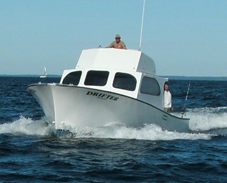 The Drifter Too, a 36' Harris Sportfishing Boat. The Drifter Too is a large, roomy charter boat that can easily handle six passengers. 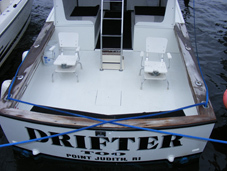 The Drifter Too was purchased and restored to like new condition by Captain Richard Chatowsky. He put many years of his spare time into this project and it shows in the finished result. This boat began it's chartering career in 2006 to replace his last boat and it is a very roomy and seaworthy vessel. Drifter Too is powered by twin diesels and carries all the electronics necessary to put you on the fish. The boat is located at Jim's Dock Marina in Jerusalem, Rhode Island. Jim's is a restaurant as well as a marina, and our boat is on B dock on the left side, third back from the end of the dock. The Drifter Too has a large cockpit.